Le Club AccorHotels and Smiles (semi frequent flier program for GOL members in Brazil) have long allowed members to move points between the program. This was beneficial back in the day when all points movements into the Le Club AccorHotels counted towards the elite status. Now, members in Smiles can convert 3 miles to 1 Le Club AccorHotels point between September 1 – December 1, 2017, instead of the usual 4 required. 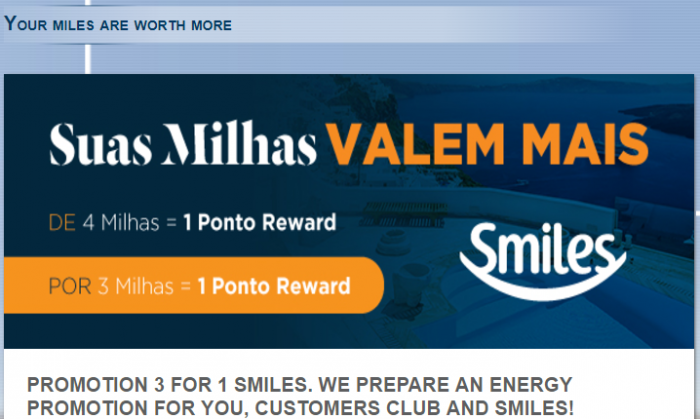 Smiles truly promotions buying their loyalty currency and converting Brazilian bank points to it on their daily emails. These Smiles can come handy due to number of program partners the program has and ability to ticket them online. I don’t think, however, that converting Smiles to Le Club AccorHotels points makes much sense unless yours are about to expire. Previous articleRyanair Eliminates Second Carry On Bag & Changes Policy For Trolley Bags, Checked Baggage Fees Reduced!